Somehow, cocktails that are simple, elegant, and timeless get overlooked. More often than not, these drinks involve simple mixological maneuvers that, once performed, seem obvious under the scrutiny of 20-20 hindsight, but had simply never been done before, and never recorded. Somewhere, sometime, somebody must have thought, “You know what? I’m going to add some bitters in my Gin Sour tonight. Just for kicks and giggles. That’ll fix ’em.” The poor guy (or gal) must’ve had one too many Bittered Sours and forgot to write it down. Unless, of course, that somebody was Dale DeGroff. The man is a legend amongst the bartending community, whipping up magic in New York bars that is, well, magical enough to earn him the moniker “King Cocktail.” He is partially responsible for the cocktail renaissance we’ve been experiencing in the past few years, and is likely even more responsible for the survival of the craft cocktail during the 1980s and 1990s. DeGroff’s two books on the subject, The Essential Cocktail and Craft of the Cocktail, have been deemed essential mixological reading. The Fitzgerald comes from the former of these two books, and is a Dale DeGroff original. I first came across the drink on David Solmonson’s 12 Bottle Bar blog (the entire site being a tremendously fantastic idea in the first place). As mentioned before, the Fitzgerald is essentially a Gin Sour (2 parts gin, 1 part lemon juice, 1 part simple syrup) with bitters. Shake with ice and strain into a chilled cocktail glass. Garnish with a lemon wedge or lemon wheel. It’s mind-bogglingly simple; the bitters add a fantastic bit of complexity, giving the drink “depth spice and roundness,” as Solmonson mentions, and turning the cocktail a light, pinkish orange-yellow. The drink is rounded and smooth, with a very nice balance of sweet and sour. I used Aviation Gin this time around, which is more floral in its aroma and less juniper-forward. Plymouth or American gins work well here, though I’d be interested to try some piney gins in this one, particularly since 12 Bottle Bar plays with rosemary syrup and other herbs in this drink (check out their variations, listed at the bottom of their article). De Groff’s original recipe uses 1 ounce of simple syrup and a 3/4 ounce of lemon juice. The Fitzgerald is also highly modifiable. What if you used, say, rum? Or whiskey? That sounds worthy of experimentation, to me. The drink turned out to be quite popular at the first meeting of the Heron Club (the ladies loved it! ), including a variation using orange juice, which you may want to reduce to half an ounce. Cheers. Absolutely right, simple perfection. Exactly what I needed tonight. 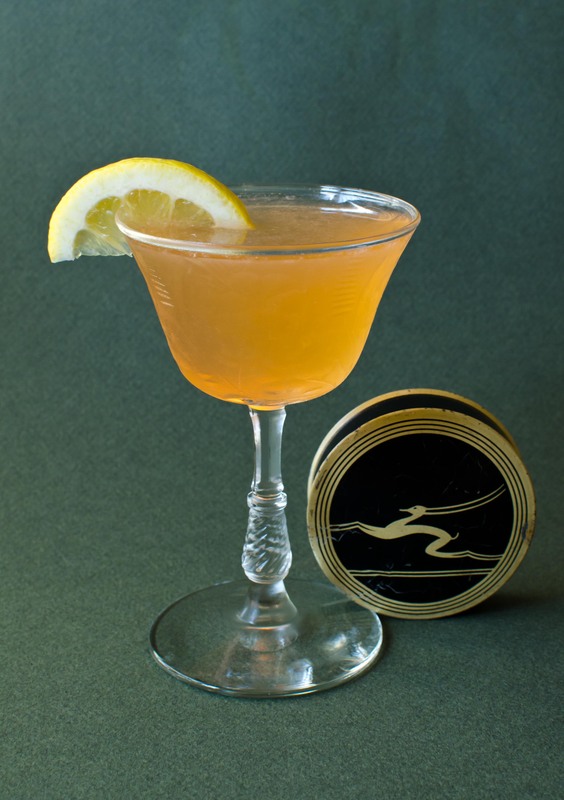 This entry was posted on September 11, 2011 by IJ Lauer in Angostura, Drink Recipe, Gin and tagged angostura, bitters, cocktail, fitzgerald, gin, gin sour, lemon, recipe, simple syrup, sugar.